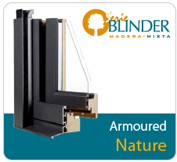 ELEVATING-SLIDING, TILT & TURN AND BI-FOLD DOORS. 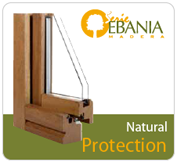 Among the available solutions in any of our series, EBANIA WOOD or BLINDER MIXED WOOD, there are sliding doors in elevating, tilt and turn and bi-fold. With this type of exterior access, growth of openings in the facade is obtained, reaching up to 9 metres in 3 panels, joining both interior and exterior environments in one same place. Terraces, gardens, swimming-pools, porches, atriums and patios are integrated into one larger space and all of this without having to give up maximum isolation, water tightness and security.